Radiant skin and healthy hair require a focus on care, both internal and external. What you put into your body is just as important as what you put on it. Of course, you should be prioritizing healthy eating for many reasons—but why not also benefit by having beautiful skin? Did you know that some foods can even help reduce UV damage to your skin? It’s true! Here are some of the best things you can eat for both your overall physical health and to beautify your skin. Citrus has a whole host of skin boosting benefits! One of the most vital is limonene. What’s the big deal about limonene? Well, for one thing, studies have linked it to reducing the risk of skin cancer by about a third! Of course, that’s not all citrus fruits have to offer—they’re also packed with vitamin C, which can help to repair damaged cells. You can receive vitamin C’s healing benefits topically, too, in our VITAL C collection. 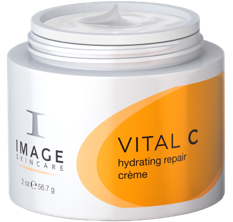 Our VITAL C hydrating repair crème is a great place to start! Antioxidants come in a variety of forms, and one of the easiest ways to make sure you’re getting plenty in your diet is by eating lots of dark, leafy greens. Kale, spinach, dark lettuces and Swiss chard are the superstars here. They contain zeaxanthin as well as lutein, both antioxidants that have been shown to reduce UV damage in skin cells. Don’t feel guilty about indulging in that cedar plank salmon! Omega 3 fatty acids have been shown to help prevent age-related damage and UV damage to skin. Oysters are another great source of this powerful skin-nourisher. If you’re not a fan of fish, don’t despair. Walnuts, almonds and other nuts also contain essential fatty acids that have similar benefits. Who said PB&J sandwiches are just for kids? Almonds are known for their ability to help reduce swelling and inflammation, too. Nuts and seeds also help support your body’s production of collagen, which can help fight wrinkles and keep skin young. You can boost your body’s collagen with a supplement, too, like IMAGE Skincare’s Daily YANATMCollagen Supplement. You’ve probably heard about carrots being good for your eyes, but did you know they’re also great for your skin? Carotenoids, which give carrots their orange color, help reduce UV damage. They can even make your sunburns less severe! Of course, you’ll still also want to fight UV damage with products that protect your skin from the outside in, like our PREVENTION+ daily hydrating moisturizer SPF 30. EGCG (epigallocatechin gallate) is an important antioxidant, and green tea is brimming with it. It helps your skin by fighting free radicals, which can lead to early aging and even result in cancer. On top of being great for your skin, green tea’s EGCG content can also help preserve cognitive function, so it’s good for your brain’s health as well! Oh, and green tea can be good ON your skin too, in the right formulation. Our ORMEDIC balancing antioxidant serum is a great choice.